Erongo RED reached another milestone on Friday, 20 December 2013 when 165 houses in Omkhaindare suburb in Uis were electrified for the first time in over 30 years. The electrification of these houses is part of the company’s new vision to provide electricity to all by 2020. The Uis project was initially scheduled to be completed early next year. However, Erongo RED decided to fast track the project so that it can be completed before the festive season. Over 250 residents from Uis and surrounding villages were in attendance to observe this milestone. The team from RAYLEC Electrical Service and Erongo RED worked industriously on the project to connect houses with electricity at the cost of N$ 1.5 million. In addition to the electrification of these houses, Erongo RED erected 21 streetlights in the suburb of Omkhaindare in Uis to provide illumination at night. Erongo RED also installed pre-paid meters in all 165 houses. Erongo RED is committed to supplement the government’s efforts of building a robust, sustainable and prosperous Namibia by the year 2030. And we are fully aware of the importance of electricity to the economy of Namibia. For that reason the company has been busy these past months to upgrade its network capacity in various towns to meet the growing demand for electricity. 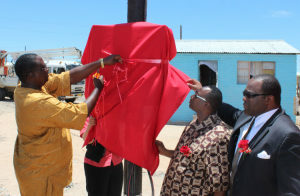 Erongo RED’s renewed focus to connect the unconnected shows that the company is committed to distribute and supply electricity as mandated. Erongo RED is also busy with similar projects in Omaruru, Karibib and Usakos as part of the company’s vision “electricity to all by 2020”.